Dr. Donald Backstrom, a chiropractic physician and Ronna’s life partner, participates in the film by sharing his experience of helping people heal on their journeys to wellness. Well known authors, teachers and scientists join Ronna and Donald to share their heart-based wisdom. Gregg Braden, international best-selling author reveals the global impact of heart-based, emotional connection and how it correlates with the electromagnetic fields of the earth. Mary Morrissey, Co-Founder of the Association for Global New Thought and Life SOULutions, narrates the film and shares some of her key heart-based principles of living. Dr. Joe Dispenza, chiropractor and researcher, offers his teachings on creating a new reality. Colin Tipping, founder of the Institute for Radical Forgiveness provides a step-by-step process to heal your heart. Scientists and researchers from The Institute of HeartMath contribute their latest findings on the benefits of heart-based living. Other teachers join the cast to contribute to this heart-centered film of inspiration. Ronna shares her personal journey to heart-based living in the film. Step by step, you will learn how this way of living allowed her to heal from prolonged childhood abuse. “When I set out to make this film, I never intended to share my personal story.” Watch how the film took Ronna into her own journey, the journey to heal her heart. The gift of her personal heart-based journey shines through in her compassion, her vulnerability, her joy and her message of living in a new way. Ronna is joined by others, like you, who have walked their sacred journey of the heart to a critical choice: the choice to stay in fear and restriction, or the choice to let go and love. “There is no secret,” says Ronna, “it is science-based and spirit-led that creates the connection.. and that connection comes right from the heart!” Many people share the steps that led them into their own hearts. 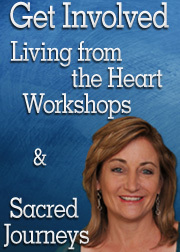 They share what is working for them now… this film provides a wealth of tools, information and most of all, inspiration to invite YOU deeper into your own sacred journey of the heart.